At the foot of the Rocher de la Baume, the french city of Sisteron. 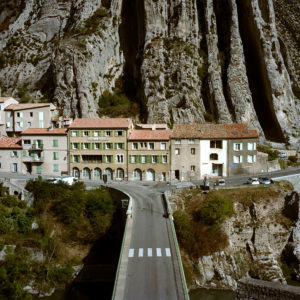 The bridge spanning the Durance allows to connect the two parts of the city of Sisteron, built at the foot of the Rocher de la Baume in part. Le pont enjambant la Durance permet de relier les deux parties de la ville de Sisteron, bâtie au pied du Rocher de la Baume pour partie.